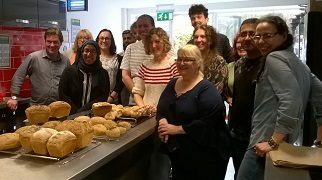 Executvie Director of CALS, Kathryn Burgess, had approached Planet Leicester Bakers about the possibility of including bread making in a team away day. She felt it would be something completely new to the staff, and a lovely fun activity to get them relaxing and working together. PLB was able to recommend a community kitchen and meeting space in the city centre for CALS to hire that would accommodate a large team of 17. Smiles all round. An extremely happy staff team of new Silver Star Planet Leicester Bakers! Kathryn planned the business of the day to work within one of two bread making timetables proposed by Planet Leicester Bakers. As Executive Director she found the relaxed atmosphere and bread activity encouraged staff to participate fully in the business planning and discussions they needed to have – leading to a productive and worthwhile day away from the office. Kathryn Burgess, Executive Director, Community Advice and Law Service. The bread making was planned by Planet Leicester Bakers in a way so as to encourage collaboration, negotiation and team decision making. It was also a chance to learn a brand new skill in something non-competitive with potential benefits for the staff team’s well-being and health. Tom, CALS staff team member. The team went away as certified Silver Star Planet Leicester Bakers and were delighted with the results of their hard labour. Great bread aplenty from the CALS staff team. 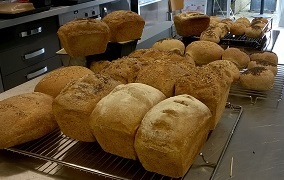 More information on Team Building with Bread can be found on the Tailored Services page. Enquiries are always welcome. Planet Leicester News: Edition 2 OUT NOW!